Feed them when they are hungry. Shelter them when they are without. Raise money when they are in need. 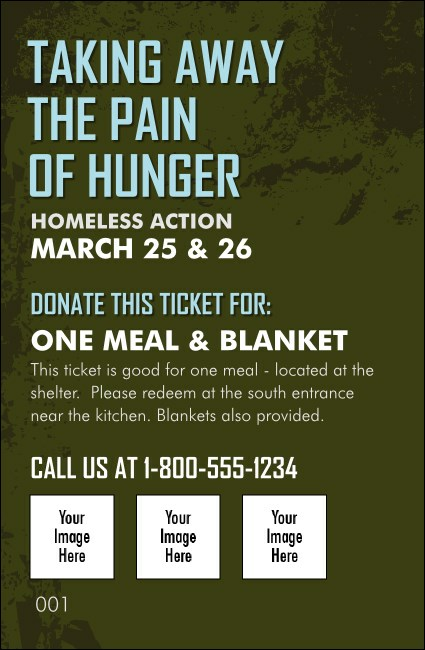 The Homeless & Hungry Drink Ticket plays an important role in your organization's next fundraiser. Whether you're hosting a charity auction or a benefit concert, this ticket template allows you to manage food and beverages and provides an opportunity to bring in more money. TicketPrinting.com is here for you with great service and products!